Then I thought surely there must be local electronics gurus who make these. Any thoughts/advice? 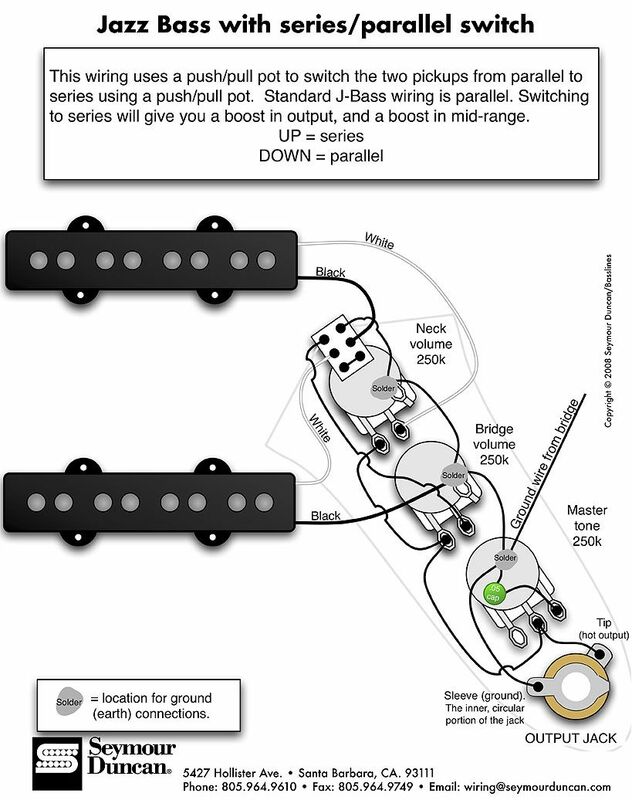 Seymour Duncan has a great collection of wiring diagrams. eg.. Even if you buy a replacement to install yourself, you'll still have to solder the pickup leads. FWIW with a jazz, I'd recommend linear pots for the two volumes because they are easier to tweak for pickup blend. And also, if you do buy a prewired circuit, don't buy in to the high-voltage-caps-sound-better thing. It's pretty much nonsense. Switchcraft jacks are good quality and I'd strongly recommend these. As for pot brands, really any pot, even cheapies will last a good long time if soldered correctly. Thanks man, I did come across that diagram but my soldering skills are woeful! Hence hoping to find one pre-assembled by someone with the skills and knowhow. Or did you mean to take a wiring diagram to a local tech guy? Bassbass you answered my question faster than i could type That's good info, thanks. What about 250 vs 500 value pots? Yeah 500k pots will give you just a hair more brightness. If you use them I'd definitely use linear (B) tapers for vol. (use audio taper for tone though. The difference is pretty subtle. If you use flat wounds or don't have a tweeter in your cab you won't hear any difference. Try taping a strip of mild steel (at least 1mm thick) to the back of the pickup - is the fastest reversible way to see what your pickup sounds like with more mid. I have a Greco HiPower-style pup with that on semi-permanently - gives it just enough extra bite. Did you go anywhere with this JimP? I'm also thinking about swapping a stack knob for VVT. I like tone turned up for finger playing and rolled off a bit for pick playing. Finding this to be a real hassle with stack knobs. Probably impossible on a dark stage. I temporarily rewired mine for series and think that's worth having as well. Not yet, but after playing around unsuccessfully with different pickup volume & tone combinations over the weekend, my mind's made up. I just need to track someone down locally who can do it. Also toying with the idea of getting connectors wired inline for any future pickup or control plate changes. $150 to $200 posted seems to be the going rate for pre-assembled and installing it yourself. I'd be surprised if a decent local tech would cost much more than that. If you're in Melbourne I can recommend David at Melbourne School Of Guitar Making or Harvester Guitars in Seddon (he's a bass player so you know you can trust him ). Both do great work at a fair price and are happy to discuss things on the phone. I'm leaning towards DIY rewiring to just use one of my tone pots as a master, leave the other pot disconnected. I'd hate to spend a bunch of money on new controls and find I prefer the original. I'd hate to spend a bunch of money on new controls and find I prefer the original. Kinda why I was considering the connectors. Plus if I ever want to sell the bass it's an easy swap back to the original setup. An update on this for anyone who's interested... I had trouble finding someone local to me who was experienced and confident in doing this. Then I remembered that the guy my son bought his guitar from often upgrades the wiring in guitars he sells. He's in Brisbane, trades as String-Switch-Noise and is on FB as Brenton Maybury. Lovely guy, helpful, knowledgable and does great work at a really reasonable price.